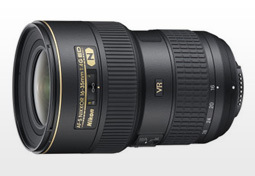 This lens is the first Nikon wide-angle that features optical stabilization. The Nikon 16-35mm was primarily designed for full-frame cameras; however, it is also usable with APS-C sensor cameras such as the Nikon D7000 or Nikon D5100, with a 25-50mm equivalent range, which makes it a short trans-standard of sorts. How well does it perform on a full-frame camera (D3X, D3, D700)? Or on the new APS-C sensor Nikon D7000? What is the difference in IQ (Image Quality) between this model and the more expensive Nikon Nikon AF-S Zoom-Nikkor 17-35mm f/2.8D IF-ED? DxOMark will try to answer these questions from an image quality point of view in this brief review. This lens mounted on the Nikon D3x obtains a very good 20 points on the DxOMark Score. However the gauge is a bit large which indicates that the IQ delivered will not be the same on the whole focal range. Looking at the DxOMark score map, we can see that the global quality will slightly decrease at 35mm. You will be able to use this lens / camera combination even in difficult conditions and be able to produce very nice large prints. Resolution remains high for the whole focal range (maximum at 16mm, the minimum is obtained for 35 mm). The homogeneity in the field is really impressive (see the comparison with the 17-35mm 2.8 below). Chromatic aberration remains very well controlled on the whole focal range. For a wide-angle this is once again a very good result. Vignetting and distortion, the classic weakness for wide-angles, are pretty well controlled, but vignetting at f/4 remains a bit strong (> 1 EV in the corner). Distortion at 16mm could become slightly frustrating, but it can be corrected with post-processing. With a score of 19 for the D3 and D700, the performance is very close to that for the Nikon D3X. To put it succinctly, the performance of this lens is very good on the 12 Mpix Nikon D3 and Nikon D700 sensor. The score comes close to that of the Nikon D3x in a low-light condition. The reason is that in this condition this lens is not fast enough, to compensate, the photographer will have to increase the ISO thus increasing noise. The Nikon D3x will be more affected than the Nikon D3 and Nikon D700, both having larger pixels. For reference have a look at the DxOMark sensor results for the 3 cameras available here Nikon D3X, Nikon D3, Nikon D700. In summation: in a low-light condition, the higher resolved Nikon D3x gives the same IQ with this lens as the Nikon D3 and the Nikon D700. In a correctly-lit living room: this are the lighting conditions used for the DxOMark score and they are described here. In a photo studio: here, lighting normally isn’t a problem, a photographer can use the ISO and the aperture he or she wishes. For those interested in a comparison under good lighting conditions take a look at the Mid-Light Score. In conditions worse than those of a correctly-lit living room: here, the Nikon D3 and the Nikon D700 would be able to provide better results than with a Nikon D3x. The score is 11 and for an APS-C camera this score is pretty good. Of course, the low-lighting conditions are more challenging when the sensor size decreases. The homogeneity of the DxOMark score gauge: On an APS-C sensor, the global IQ will be very close on the whole focal range, contrary to the results on full-frame sensors. Resolution at the center is high: even on this selective small pixel sensor, this lens provides very sharp pictures at the center. Vignetting and distortion remain pretty low. But distortion remains better controlled on the older 17-35mm f2.8. The two lenses have high lens shading at the larger aperture for their minimum focal (ie 16mm and 17 mm respectively). Looking at the results, we wonder if we will ever have a new version of the famous Nikon AF-S Zoom-Nikkor 17-35mm f/2.8D IF-ED with the 16-35mm improvements.